It's nice when a place stays around long enough to make it part of your routine. Puro Peru in Sandy just celebrated 18 months in business in a rather obscure location where you might not expect to see an eatery. But the restaurant must be doing something right—and that something is a little taste of Peru right here in the Salt Lake Valley. Puro Peru sports a festive atmosphere with Spanish music, soccer on TV and a stage for weekend entertainment. The restaurant's atmosphere perfectly complements the authentic cuisine. 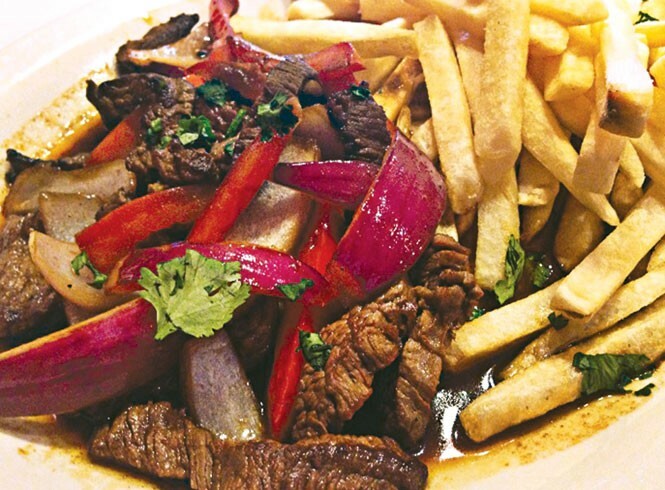 The waitress recommended the lomo saltado (jumping beef) as a way to try some true Peruvian food. It's a sautee of sirloin, tomatoes, onions and french fries, cooked in vinegar and spices, then dusted with fresh chopped cilantro and served with rice. The vinegar gives it some mouthwatering tang, while the red onion gives it a delectable sweetness. It's a beautiful dish, both visually and to the palate. Go with the cilantro rice as your side dish. It may not be a kind of rice you're used to seeing, with its dark green color, but don't hesitate; it's loaded with delicious herbs, and could be a meal on its own. The menu also has a platos criollos section, which our server said were more "country, down-home" Peruvian dishes. They looked amazing, but will have to wait until the next visit. Considering how wonderful the food is, Puro Peru has the potential to become a local landmark.